I’ve always loved bluebells. I can understand the poet Gerard Manley Hopkins when he talks of it in moving and spiritual terms. 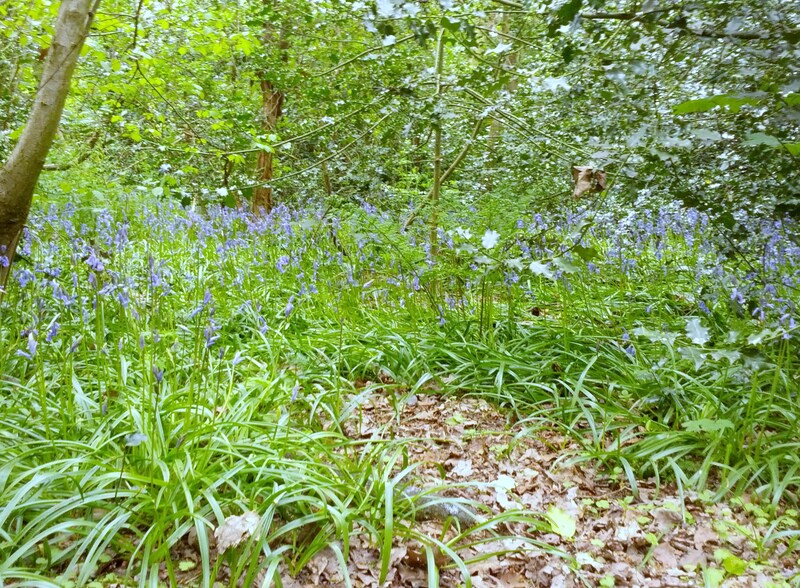 In fact, one of my favourite memories of bluebells was being taken into our school woods by an English Literature teacher on a bright spring day to experience the inscape and instress of bluebells, to illustrate what Hopkins meant in his poetry. We sat on a beautiful blue carpet , surrounded by woods and birdsong and bluebells, meditating on their beauty and being. The sweet, light fragrance, the shape of every hanging bell, the blueness of blue and the greenness of green. I even ate one, to more fully understand its uniqueness, to try and immerse myself in it.It tasted like… well, it tasted of bluebell, which was the whole point of the exercise (I don;t think they’re poisonous, and it certainly didn’t kill me, but please do check before you try this at home. It was a powerful experience – both in appreciating the beauty of nature, and also intaking poetry off the page and making it alive, vibrant and meaningful. I’ve never been able to pass a bluebell wood without stopping in awe, and don’t; know of many sights more awe-inspiring in their simplicity. Blue is a calming and healing colour to many – and so to witness nature creating its own blue carpet in such a dramatic fashion strikes me as a calming and healing experience. A few years ago, I was fortunate to discover a secret Bluebell Grove close to my flat, part of the River Sowe Pathway in South Coventry. I say secret – it was just neglected, overgrown and seemed forgotten by most people. So whenever I took a walk down there, I never seemed to meet anyone and it felt like a sacred and special place. Like my rooftop garden in a previous blog The raven, the beaver and on making happy tracks in non ordinary reality. I also liked its description as ‘semi ancient woodland’ which made it seem full of spirits faeries and dragons. And, who knows, perhaps it is – I can only say I haven’t found them. Or they haven’t found me. But it does have pockets of bluebells – sometimes vast open carpets, sometimes shy little blue patches, sometimes exotic tree and ivy framed vistas. Each of them makes me stop and stare. I’ve shared the place with my family, who also felt a sense of wonder and excitement at the little bluebell grove. My parents have lived in the area for nearly fifty years, and had no idea it was there. We’re not only visitors, we’ve also become gatekeepers. But I’d be more than happy to show you around sometime. There are also a couple of Dark Things about The Grove you should also know. One is The Bridge That Shall Not Be Crossed. Which is just a bridge over the river. But,if, like me, you have fear of heights or edges, it’s very intimidating – it appears easy enough but, halfway across, I had A Turn and realised the handrails are just a little too far apart yo hold onto, and that the metal tubular bridge itself is just too open and scary. I made it to the end but couldn’t get back – resulting in a mile and a half round trip to get back. So much for CBT and managing panic attacks. And then there’s the Blair Witch Encampment. The Grove is home to kingfishers, otters and bats, so the local wildlife society arranged a BatWatching Night late one summer evening that my father and I attended. All was going brilliantly, and we were all given Bat Detectors to pick up Bat signals from those we couldn’t see. Loads of the, absolutely loads – and not a frightening vampire bat among them. So, after a great evening of local wildlife watching, I led dad off on a shortcut to show my knowledge of The Grove. Things look very different in the dark there, even if you’re shuffling around with torches like Mulder and Scully. I took a wrong turn, and walked into a clearing with an enormous wicker structure left by lord-knows-who for lord-knows- what. I didn’t quite scream ‘RUN FOR YOUR LIVES’ but I think Dad picked up on the urgency of my retreat, and we’ve never spoken of it again. I’ve been back several times and never seen the wicker structure, or even the opening it stood in, again. There are other bluebell woods, but none seem as magical and enchanting as my Secret Grove. I’ve just come back from a long walk in another local bluebell wood. It has signs on the trees warning of police patrols, as it’s also a notorious dogging spot. This entry was posted in Uncategorized and tagged bats, beauty, Blair witch, bluebells, dogging, gerard manley hopkins, grove, wildlife, woods.